Synaptol is a homeopathic supplement that is available over the counter for the treatment of Attention Deficit Hyperactive Disorder. It is promoted as a natural remedy for individuals who have difficulty focusing, listening to instructions, controlling impulses or paying attention to one task at a time. Synaptol markets itself as an herbal alternative to ADHD medicines such as Adderall, using flower essences that are supposed to stimulate your internal healing processes to optimize brain performance. Reviews posted on the Synaptol website state that this supplement can improve the ability to concentrate, and increase energy and memory capacity. Synaptol is manufactured by a company known as HelloLife and it is a liquid formulation. The manufacturer claims that in many cases it can lead to almost immediate symptom relief. Of course, additional time may be required to feel the full beneficial effects. This supplement is also considered safe to be used for both adults and children. However, it should also be noted that there claims have become a target for FDA regulators, leading to some of their claims being recalled. This supplement is still currently available, though its reputation has taken a hit recently. Synaptol is formulated as a homeopathic remedy for ADHD. This means that it is thought to work by stimulating the body’s natural healing power. It includes a number of different ingredients like Aconitum ferox, Adrenalinum, Apis mellica, and Avena sativa that have been reported to improve concentration. Many of the ingredients included in this supplement are officially recognized as homeopathic substances. Some of the additional ingredients include Aesculus hippocastanum, flos, Argentum nitricum, Baptisia tinctoria, Cochlearia armoracia, Phosphorus, Scleranthus, annuus, Scutellaria lateriflora, Sumbul, and Viola odorata. You may have never heard of many of these ingredients. They are all natural plants, flowers, and others that are recognized as having homeopathic effects. While the exact mechanism by which Synaptol relieves ADHD symptoms is not known, the interplay between these natural extracts is said to boost executive function related to attention. This supplement is most often used in cases of ADD and ADHD by individuals who are wary of prescription drugs like Adderall or Ritalin. There are numerous reports that claim it is helpful in providing relief for many symptoms without having a stimulating or arousing effect. This has been reported in both children and adult usage. Although this supplement is not technically considered a Nootropic, it does have some similar effects. This includes improving your overall focus, concentration, and speed of memory recall. This also serves to help people become less forgetful and make fewer mistakes whether they are at work or school. Many users also report other benefits. This includes being able to sleep better. By better we mean higher quality and more restful sleep. Additionally, many people find themselves being able to relax easier and fall asleep more quickly. Synaptol is also reported to affect your mood in positive ways. In many cases, you may see an overall increase in positive mood. You will notice fewer mood swings and even less feelings of anxiety and depression. Many users note that they feel more confident and organized. Students will be better able to focus on their work and grades typically improve over time. The actual Synaptol dosage will depend on your age and weight. Small children (who weigh 30 to 50 pounds) should take 0.5 ml twice a day. For kids who weigh more than this, they should be taking a full 1 ml, twice per day. This dose should be split up into two different administrations in order to maintain a consistent supply within your system. The best way to do this is morning and evening doses. Take this supplement either straight, or with 8-12 ounces of purified water. Many people will feel some effects within just a few hours, although it may take 3 to 6 months of supplementation in order to begin seeing the full effects of treatment. Store the bottle in a cool, dry location and keep it away from contact with metal, electrical devices, and appliances. There have been a number of reported side effects although it is still unclear as to whether these were solely the result of Synaptol usage. Some of these include sleeping problems, nose bleeds, headaches, and loss of appetite. Most of these reported effects were mild. In general, since this is a homeopathic formulation, there may be a wide range and variety of side effects with each person. Synaptol could be an effective treatment for those suffering from ADD and ADHD, although more research is needed for conclusive results. It seems that Synaptol works very well as a natural brain booster for some people and not at all for others. 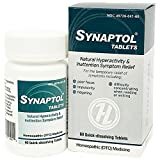 On one review site for this product, almost 80% of people who reported on taking Synaptol gave it a rating of 1 out of 5. If you are a fan of homeopathic medicine, you may want to give this product a try to alleviate symptoms of ADHD. However, better and faster outcomes may be achieved by instead trying a supplement that has a positive effect on neurotransmitter activity in the brain. The Racetam class of nootropics (like Piracetam and Aniracetam) are known to increase working memory capacity as well as enhance executive function related to paying attention. These supplements have significantly more research behind them while Synaptol still suffers from a deficit of experimental data. i am searching synaptol syrup all over egypt, i could not find it, how can buy it ? ?